Just two weeks ago Vogue Paris stirred up controversy for colouring Lara Stone’s skin into a dark, near brown tan for an editorial ph by Steven Klein (see full spread here). It’s a misstep on Carine’s part that the spread is linked with racism, if they would like to feature a black model for a supermodel issue, they could get Naomi or Liya any time. However, there is not a singlre black model for this issue. But seeing this from an artistic vision, they are probably trying to do something different with Lara because she already had one entire issue dedicated to her and theref0re a fresher, newer look had to be used for Lara’s future spreads if they were to feature her again and again, something team Vogue Paris love to do. For example, she went brunette for the September main story. 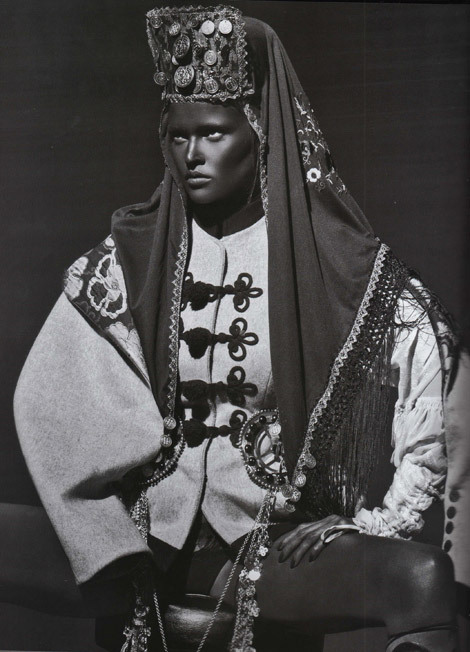 Darkening a model’s skin tone is one of Steven Klein’s trademark. Remember this Vogue US 2008 September issue spread he shot, where Caroline trentini was dyed black? And check this out, power model twins Donna and Gwen Loos in a spread together for Dutch Glamour (not by Klein though), Donna (or Gwen?) is in black. Depending on how people see it, colouring a model’s skin tone is quite a risky thing to do right now, no? this one isnt any better…. @ Test Shoot Gallery is does when you are…..